A fabulous townhouse with private use of a municipal patio located in a village near the market town of Tremp. The house has been semi renovated, but is in need of some modernization. It has great potential to become a fantastic holiday home. For lovers of the real Spain, but still only about 2 hours’ drive from Barcelona. With great taste and respect for the original features restored semidetached house with garden. This characteristic property is located in one of the prettiest villages in the area. This medieval village where water plays the leading role and which has its own waterfall is located in the Pallars Jussà region (Tremp). Have you ever dreamed of having your own house near the lovely historical town of Aínsa? Now you have the perfect opportunity! On this plot you can build a beautiful large villa of 200 sqm. The plot offers impressive lake views and is located in a beautiful authentic village. In the heart of a small picturesque and calm village this house, restored preserving a rustic style with a modern touch, offers ample spaces, a large patio and magnificent views. The village has been declared of Cultural Interest by the Catalan Government and has a superb situation near the lake of Montcortès. Stunning country property with outstanding views and about 3 ha. of land. The building is partially restored with a new roof and internal floors. This beautiful property is in a magical location away from it all but still quite near to all amenities; it is a 25 minutes’ drive to Sort and to La Pobla de Segur. Authentic natural stone property with splendid views. The main property has been tastefully reconstructed offering 5 bedrooms, 3 bathrooms, a kitchen, dining room, a living room and different terraces. It comes with a separate but attached house. This part is to be finished. Beautiful location near Sort (Pallars Sobirà). Detached townhouse to renovate completely. 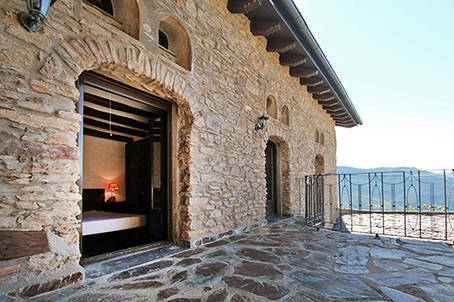 This natural stone house is located in a scenic village in the Pallars Sobirà region, close to the lively and tourist village of Sort. Magnificently situated detached village house located in a scenic village in the Pallars Sobirà region, close to the lively and tourist village of Sort. This beautiful natural stone property needs to be completely renovated on the inside, but has everything to become a delightful rustic (holiday)home with great views from the terrace and patio. Ready to move into and spacious townhouse with a garage, a beautiful vaulted wine cellar and 3 terraces with stunning views. This house is situated in a small village just 3 km. of the nice market town of Tremp with all amenities. A magnificent house with stunning dramatic 360° views. It sits in the middle of more than 80 hectares (198 acres) of land, accessible by a private road. The house is newly built with high quality materials and is self-sufficient in electricity thanks to its 60 solar panels. Authentic hay-loft, converted into a commodious house with large terrace. This house is situated in a picturesque hamlet and has stunning views over the Pyrenees and the valley. Natural stone ruin to be completely rebuilt. It is possible to make a single house or to build 3 independent apartments. This ruin is located in one of the prettiest villages in the area. This medieval village with its own waterfall is located in the Pallars Jussà region (Tremp). Splendidly situated and spacious detached house with a garage, terraces and a garden located in the quiet, green valley of the river Isábena. The house is in perfect condition. All rooms and the terraces have magnificent views over the surrounding mountains. This attractive rustic townhouse is located in a beautifully situated small village. It has a good sized roof terrace boasting great views over the valley and the surrounding mountains. This well priced townhouse is just 15 minutes from La Pobla de Segur with all amenities. Charming village house with large walled courtyard. Nothing needs to be done to this lovely 3-story house and it is sold fully furnished. And, it has a very good location in a small village, near the small town of La Pobla de Segur.